Starting on July 1, drinking from a Styrofoam cup on the grounds of a Miami-Dade County park or beach could land you a hefty fine. Styrofoam is a derivative of polystyrene, a petroleum-based plastic that contributes to land and water pollution. On Tuesday, Miami-Dade County announced a measure that would prohibit the use of all polystyrene products – such as cups, bowls, plates, lids and cutlery – in all county parks, including beaches. The ban is intended to improve the public health and safety of residents and visitors as well as marine life. Other places, such as New York City and Washington D.C., have also banned polystyrene in parks and beaches. The Environmental Protection Agency and the International Agency for Research on Cancer have classified polystyrene’s main ingredient – Styrene – as a possible human carcinogen. Additionally, polystyrene is America’s fifth largest creator of hazardous waste, according to the county. Beginning on July 1, anyone who violates the rule is subject to a $50 fine, a spokesperson said. However, as of now, the county is "stressing education, prevention and promotion of this initiative, rather than fining patrons for the violation." The list of items made from polystyrene is vast, but there’s an easy way to identify if something you’re using is made from the material: Look for the plastic resin code #6 (PS) on the product, or the box containing the product. Park-goers and patrons are advised to use alternatives to polystyrene products, like aluminum, recyclable plastics, coated and uncoated paper, or compostable plant fiber products. 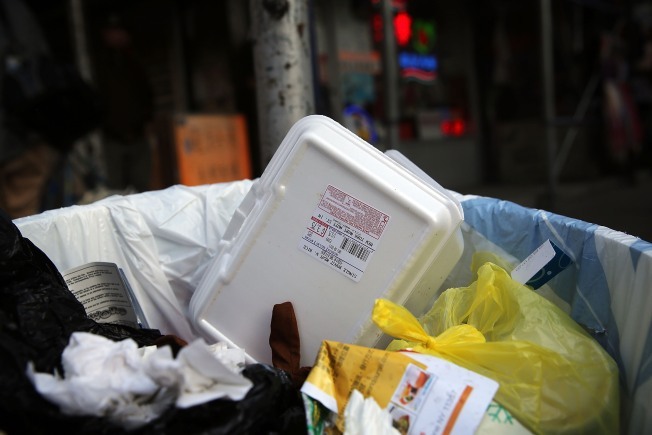 County vendors and food establishments are prohibited from selling polystyrene products.